International Boat Shipping takes a bit more organization and planning time, as there are many additional preparations that will need to be made in shipping a boat. Working to get you the best departure time, along with the most cost- effective rate to ship your boat can be time consuming. We can advise you on a great number of options to get your boat to its new destination. Foreign buyers are seizing the opportunity to purchase boats here in the U.S. and have them delivered to their new home ports. Boats of all sizes, makes and models are being moved all around the globe, everyday. 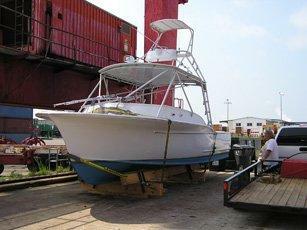 We make it easier for you with your overseas boat transport. When Shipping A Boat it has to be loaded either on its own trailer or a cradle will need to be built for it. There are exceptions to this rule, as there are some facilities that do not require either of the above. Accurate dimensions of your vessel are a must, as charges are based upon total cubic feet. Estimating or guessing at dimensions can cause increased transport charges. Most carriers do not pick up at every port. 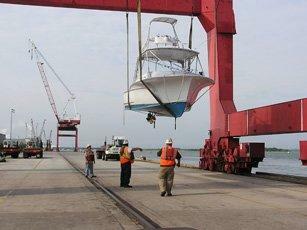 Leave it to us to arrange for the proper vessel to deliver your boat to its overseas destination. Shipping Lines work on a very tight schedule. A sailing date will be agreed upon and set. It is important to have your boat at the port of departure, and all the necessary arrangements made before this date. If your boat needs a cradle, be sure to give the craftsmen building it plenty of time to have it ready before your international boat shipping date. When preparing for an International Boat Transport it is often recommended to have the boat shrink wrapped, but it is not necessary, unless required by the carrier or you just prefer it. Additional insurance for your boat while in transit should be obtained. This is money well spent. The cost usually runs about 1.5% of the boats value. Most of the time, all freight charges will need to be paid for in advance. Please take note that Overseas Boat Shipping quotes normally do not include taxes and destination charges. W e will handle the entire process for your international boat transport from the pickup location to its final home port. We coordinate the preparation, loading, highway transport and overseas boat transport for a safe delivery to your vessel’s final destination. Questions or concerns? Call us for help to ship your boat.